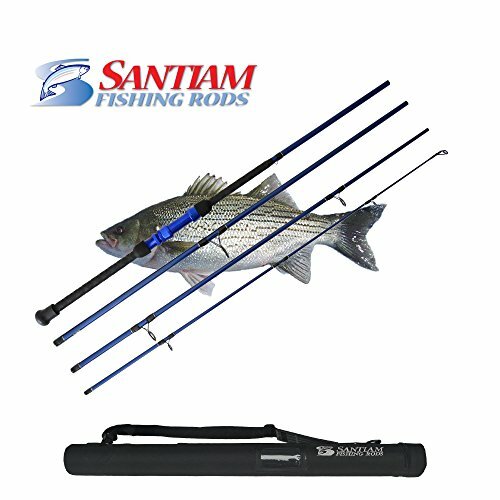 There are many surf rods you can use for saltwater fishing but few as a 4 piece rods intended for travel. We produce models ranging from 9'-12'. We have produced what we see as a tough surf rod with travel in mind. Made of quality composite blanks, with a tough slim X Flock grip for casting ease, durable anodized aluminum reel seat, and aluminum oxide guides with ceramic inserts. THE LARGEST SELECTION OF TRAVEL RODS IN THE INDUSTRY! Visit www.santiamfishingproducts.com for additional details. Section Length 33" Perfect for air travel. Slim X flock grip for casting ease ,durable aluminum reel seat, and aluminum oxide guides.